KANSAS CITY, Mo. – The name of Avila’s basketball facility, Mabee Fieldhouse, shold have been a strong indicator that things would go positively for the Kansas Wesleyan Coyotes on Thursday night. The Coyotes improved to 10-2 playing in places named Mabee (9-2 at home, 1-0 on the road), including a 9-0 mark in conference play thanks mainly in part to a huge offensive and defensive fourth quarter as KWU routed the Eagles 75-55. Trailing by five at halftime, KWU regained a four-point advantage in the third quarter and outscored Avila 21-5 in the final 10 minutes for the win. Avila shot just 13.3 percent in the final period, while KWU shot 50 percent from the field. Avila used a big quarter of its own in the second, outscoring KWU 23-14, to take a 39-34 lead at the half. Avila led by five at one point in the quarter before the Coyotes rallied to take a 34-33 lead on a three-point play from Kayla Kivinski (SR/Port Richey, Fla.). Avila scored the final six points of the quarter to take the five-point lead into the half. Kivinski led the charge for the Coyotes out of the gates in the second half, as she buried a triple to give Wesleyan a 42-41 lead with 8:24 left. Kivinski’s free throw with 6:10 tied things at 47-all, and Lauren Flowers (FR/Overland Park, Kan.)’ score with 3:39 left put the Coyotes ahead for good. Wesleyan (17-6, 15-2) scored the first nine points of the final quarter and never looked back, holding Avila to only eight points for the final 16 minutes of the game. After a mostly back and forth first quarter, the Coyotes pulled out to a 20-14 lead with a minute left before Avila got within four at the buzzer. Avila built as much as a five-point lead in the second before the Coyotes stormed back to take a 30-29 lead on Amanda Hill (SO/Rossville, Kan.)’s bucket with 3:34 left before the half. Four players reached double figures for the Coyotes led by Kivinski with 14, while Courtney Heinen (JR/Axtell, Kan.) scored 13 and Virja Lewis (SO/Kansas City, Kan.) and Haleigh Bradford (JR/Schertz, Texas) had 11 each as KWU shot 41.7 percent for the game, including 51.5 percent in the second half. Lewis led the Coyotes with nine rebounds. KWU committed only nine turnovers in the game. It’s a quick turnaround for the Coyotes as Wesleyan heads back to the Kansas City area on Saturday to Leavenworth to take on Saint Mary at 5 p.m. at the Ryan Sports Center. KWU is back at home on Wednesday hosting Ottawa. KANSAS CITY, Mo. – Kansas Wesleyan men’s coach Anthony Monson didn’t care about style points or glossy numbers. A simple victory on the road in any way, shape or form would suffice. A late 13-4 run gave KWU a 10-point lead with 47 seconds left and the Coyotes fended a furious Avila rally down the stretch for a 60-56 Kansas Conference victory at Mabee Fieldhouse on Thursday night. Wesleyan improves to 10-7 in the KCAC and is in fifth place, half a game behind Ottawa (11-7) and one game ahead of Saint Mary (9-8). KWU travels to Leavenworth to play the Spires on Saturday. 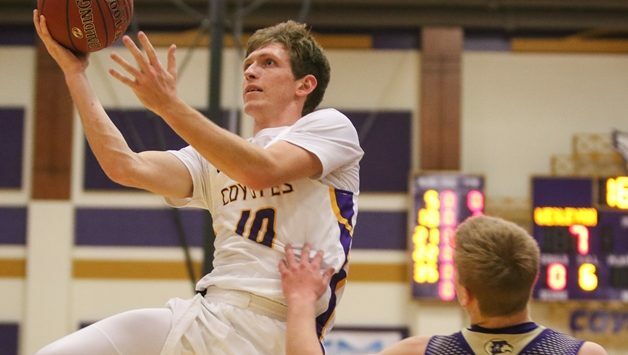 The Coyotes won despite committing 15 turnovers and being outrebound by an Avila team that had a minus-12 rebounding margin entering the contest. They prevailed as James Brooks (JR/Cherokee, Kan.) scored 21 points that included five 3-pointers, Marquis Kraemer (SO/Aurora, Colo.) had 11 points and Zach Rammelt (JR/Racine, Wis.) a season high 10, all in the second half. A shootout appeared in the offing early on as the teams combined for 40 points the first nine minutes. The flurry included 10 3-pointers, four each by Brooks and Avila’s Shandon Boone. The scoring quickly slowed to a crawl after that, though. Avila led 23-17 before a 12-2 Wesleyan run made it 29-25 just before halftime, but the Coyotes had to settle for a 29-27 advantage at the break after two Eagle free throws. The second half was close until the final 6 minutes. Leading 47-46, KWU pulled away with the 13-2 surge that gave them a 60-50 lead. But three consecutive Coyote turnovers and 3-pointers by Trey Heinrich and Darion Minor quickly trimmed the lead to 60-56 with 20 seconds left. The third turnover with 18 seconds remaining gave Avila a chance to pull dangerous close, but Boone missed a 3-point shot. Nate Leach snagged the rebound with 10 seconds left and threw the ball across midcourt to Brooks, who ran out the clock. “It just looked like we were stuck in mud,” Monson said. “You tell me we’re going to win a game on the road and Jordan McNelly (JR/Salina, Kan,)’s going to go 0 for 3 (shooting), I’d probably be like ‘you’re crazy.’ That’s what happened tonight. Boone, Avila’s leading scorer at 19.8 points, finished with 22 on 7 of 16 shooting, but made just two field goals and scored eight the second half. He scored four points against the Coyotes on Dec. 1 in Salina. Byron Cooke, who’d scored 52 in the Eagles’ three previous games, had three points on 1 of 11 shooting as Avila shot just 32.2 percent as a team (19 of 59). Wesleyan shot 40.4 percent (19 of 47) from the field and was 15 of 21 from the foul line compared to Avila’s 9 of 14. The Coyotes head back to the Kansas City area Saturday for what will be a key game against Saint Mary. The Spires lost to York 77-75 on Patrick Burnett’s basket at the buzzer Thursday night in Leavenworth. Saint Mary led 39-26 at halftime.